18th October, 2013: FISHING REPORT: Port Alberni Inlet, Barkley Sound, Ucluelet (West Coast), Somas-Stamp River System. 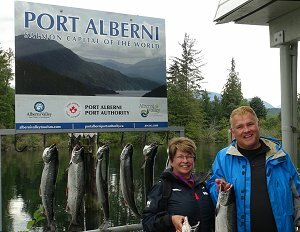 The 2013 summer sport fishing season has pretty well come to an end for most of the saltwater sport fishing locations around British Columbia. The weather in many of the Pacific Rim areas during the past week has been unbelievable and is forecast to remain that way late into the third week of October. Some avid sport fishermen who have not put their boat to sleep for the winter are taking advantage of the great fall weather and spent some wonderful sunny days with gorgeous warm afternoons in Barkley Sound during the long October weekend in attempt land one or two big Coho that are late returning to their natal streams. 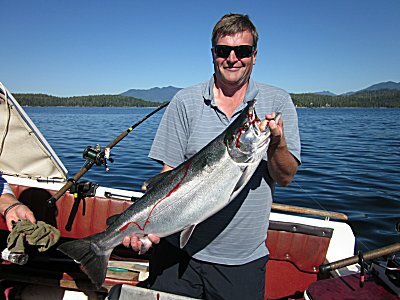 There still is some excellent beach fishing for Coho on the east side of Vancouver Island and areas such as Browns Bay, located close to Campbell River and Sarita Bay situated in beautiful Barkley Sound still both have some great Chum sport fishing. Chum salmon are a wonderful sport fish and put up a great battle. They are also great on the barbeque. The Browns Bay Chum Run usually peaks just after the middle of October. This year the Brown’s Bay Charity Chum Derby takes place on October 18th, 19th, and 20th. 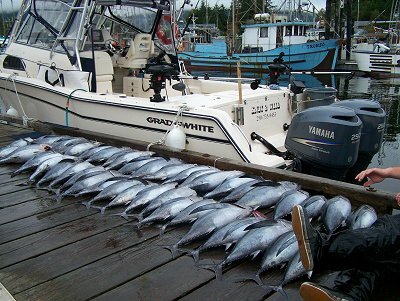 This is often one of the last fishing derbies on Vancouver Island each year. Chinook and Coho returns too many of the streams, creeks, and rivers have been very good to date. The return of Somass River Chinook salmon stocks are much better than what was forecast. Chinook returns were predicted to be just over 16,000 pieces. Chinook swimming through Stamp Falls to October 11th have already exceeded 22,600. Coho through the falls are at approximately 49,000. The Sproat Lake Chinook returns are only at 51 but the Coho returns are at 15,000. The numbers of Chinook and Coho salmon passing through the counters are quite high. The peak numbers per day usually occur at this time of year. It is fantastic to see that the Chinook returns are higher which will also add to a natural spawn in the river system. The return should really exceed the predicted forecasts especially for Chinook salmon. Some heavy rains in mid September put a damper on some of the great late September Coho fishing on the West Coast of Vancouver Island. The Coho and Chinook migrated quickly to rivers and streams as the various water systems filled with water. However areas in Barkley Sound continued to have some mediocre fishing into early October along the Bamfield Wall, the backside of Fleming and Swale Rock. The offshore fishing continued to be quite good with some great Coho and feeder Chinook fishing out at the Rats Nose and the Big Bank. For some sport fishermen and many guide and charter companies the fishing on the west coast has been extended with a new type of fishing. 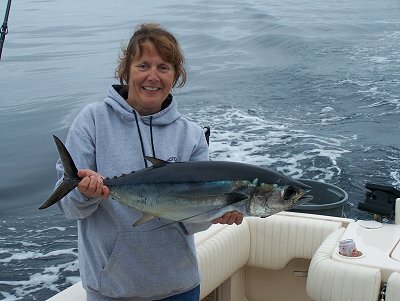 Many guides are now beginning to take guests out on tuna runs. Many sport fishermen are also loading their boats with maximum numbers of family or friends and are making the run offshore. The travel time is long and it is important that those motoring out to the tuna grounds have good offshore boats that can be iced up with plenty of sea ice as the tuna need to be bled and iced immediately. Most fishermen making the venture offshore travel with two or three other boats. This of course is a safety measure. All the boats that are guided have the safety equipment needed for these trips. Sport fishermen (not guiding) should make sure that they have all of the transport Canada specified equipment. From early September to the first few days of October the warmer Pacific currents come within 35 to 75 miles off of West Vancouver Island. The most popular area is just off the Barkley Canyon which is approximately 50 miles off of the Vancouver Island coastline. The Albacore Tuna are found in what is termed the blue water. The Tuna are on the warm water side or on the border where the warm current and cold water meet. The favorable water temperatures for the Tuna are anywhere from 14 to 17 degrees Celsius (58 to 64 F). Many of the guided trips often have three or four lines out on each side of the boat. Some have up to five lines out on each side. It does seem that the more gear out the better the results. The limits per person are 20 meaning there is a lot of work during each excursion. It is too late this year but tuna fishing is something that one may want to mull over for the 2014 season. Of course weather is an important factor. With the Thanksgiving weekend now over most of us are looking forward to the 2014 angling season. Early predictions and indicators are looking very favorable for next year. In the Port Alberni Inlet for example the returning Jack Sockeye during June and July of 2013 to the Somass system were absolutely ridiculous. The high returns of Jacks often reflect the following years run size. It is felt that Sockeye returns in 2014 will be well over one million pieces which means a very wonderful sport fishery for the number one commercial Pacific salmon. Ocean conditions have been very favorable for all five salmon species. The mortality rates have been low. The food sources for the salmon stocks in the North Pacific Ocean have been abundant. The sport fishing season in 2014 should be very exciting with plenty of opportunity for everyone. For those people that know the Stamp well the fishing for Coho has been very good. Guides have been doing a great job to date for most of their guests. The Stamp has been difficult to fish for this time of year only because the water levels have been higher than normal. The high water however has been great for migration. This is often the time of year that the fly fishing for fall Steelhead is fantastic. However the high water has hindered this fishing. The reason for the high water is that there has been some water released at the dam. The fly fishing most years occurs from the first week of October into the first ten days of November. We are hoping to salvage some of that great fly fishing. The best fishing for those fisher people in jet boats on guided trips or for those walking has been in the Lower River. Entering the river at the rifle range has been a good choice for many. Also driving out to Service Road and walking the river too Dolan’s pit is another excellent fishing spot. One needs to find an area where the water is slow and any area that the water is low. The river has already had close to 50,000 Coho migrate into the system. There should be a continued migration of Coho right into December. The Coho in the lower river have been fresh and still very bright. 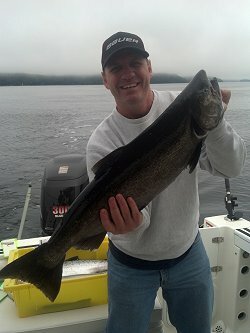 Most of the Coho landed for guests, who have been averaging limits on a daily basis, are from 8 to 12 pounds. There is of course no retention of Chinook salmon for the 2013 season. The best method of fishing has been conventional using spinners, blades, and the Gibbs Coho spoon. If and when the levels of the water drop the Steelhead in the system should become a little less sedentary and actually become very active as they search for loose eggs during the natural spawn. Fly fishermen can of course use flies of their choice but anglers who are wishing to fish conventionally can use gooey bobs, or wool that is white, pink, or orange. When the water does come down other areas to fish are Stamp Falls Park, Eagle Rock, Black Rock, Moneys Pool, and the Slide Pool. The Stamp is a very healthy river system and is fishable 12 months of the year. There is still plenty of time for salmon fishing and also Fall Steelhead. Winter Steelhead fishing begins in December and continues into late April. 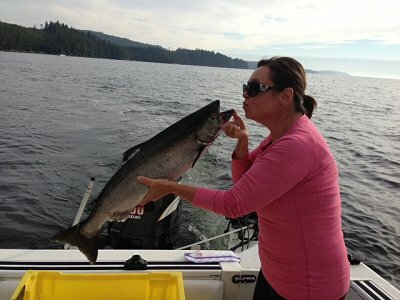 The sport fishing in the Alberni Inlet was unusual this past year. Sockeye returns to the Somass were low. This development hindered the Inlet Sockeye fishing for sport as there were no more than three very good weeks of Sockeye fishing in late June and the first few weeks of July. There was a non retention of Chinook salmon but the Coho fishing which got underway during the last week in August made up for the NO Chinook targeting and retention rule. The Inlet does have a few lingering Coho and a few Chum salmon have hit the system but no one is currently targeting them. The 2014 season looks very promising. The indicators for early season projections of Sockeye salmon are fantastic. Many are predicting that the run size next summer will be well over one million pieces which will make it a great year for all of the user groups in the Alberni Inlet. Sockeye fishing many years last for mid June into the first week of August. It is a wonderful family fishing trip and is a wonderful sport fishery for those from five years of age to ninety-five. The Chinook returns in 2014 will also have higher numbers and the fishing should return back to normal. Most years the Chinook fishing gets underway by the 15th of August and limits per angler per day is two. We will be looking forward to that sport fishery as well as Coho next August and September. There have been some wonderful days on the water in Barkley Sound right through the Thanksgiving weekend. The afternoons, especially, have been gorgeous with great warmth from the autumn sun and water that is just magically smooth. The sport season has dramatically slowed down but with some perseverance anglers over the past few days have had opportunity to land the last stragglers of the incoming or migrating Coho. Two anglers had a great time also in the Sarita Bay area with Chum salmon up to seventeen pounds. The Coho have been few and far between and have been found at Swale Rock, where there continues to be a lot of bait fish, the backside of Fleming Island, and the Bamfield Wall. There has also been a few feeder Chinook up to fifteen pounds at Swale and Austin Island. The Coho have been hitting shorter hootchie lengths from 32 to 38 inches. The best colors have been purple haze, jelly fish, AORL12 and the green spatterback. The Feeder Chinook have been predominately hitting anchovy in clear and green teaser heads. There is still a non retention rule for Chinook over 77cm in the sound from Chup Point out to one mile off the surf line. The 2013 season in the sound was very good. There were plenty of salmon from early June right into late September and even until now. The best months were June, July, August and the first half of September. The migratory fish headed to southerly watersheds were strong and the WCVI Coho salmon were just phenomenal the late summer and fall of 2013 which dramatically helped the sport fishing in a very good way. With some great lodge accommodation we are looking at extended trips into Barkley Sound for the summer of 2014. 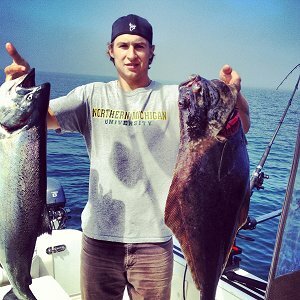 Take advantage and organize your fishing trip into Barkley Sound and offshore early for a 2014 sport fishing adventure. Ucluelet is one of those areas along the British Columbia West Coast that has opportunity every month of the year to get out on the water inshore, or offshore, or into Barkley Sound and fish for salmon and bottom fish. For many months of the spring summer and early fall there are huge numbers of migratory salmon swimming their way to natal streams, creeks and rivers to the south. These salmon are right outside Ucluelets’ backdoor and they stop on the various banks to rest and feast on herring and sardines. The salmon are usually in relatively big numbers and create a great sport fishing opportunity throughout the years more favorable months for anglers. There is also a good number of local salmon that feed close to the beach on the rich resources of bait fish. Each and every year there is a return of different salmon species to local streams and rivers that extends from mid August until early November. The fishing out of Ucluelet this year did not disappoint. The best fishing was out at the Big Bank and the Rats Nose. Day after day the fishing out in these two locations was very good. There is also the new tuna sport fishery which has been going on for a few years now. There are more guides each and every year who are suddenly showing an interest in taking guests out tuna fishing. This is extending the season by a further two to even four weeks of sport fishing. The best time is the full month of September and into early October. We are expecting the summer of 2014 to again be very good out on the various banks and also inshore outside of the Ucluelet Harbor mouth.